The Atom measures 15" long x 9.5"deep x 2.5" high. It contains a full-sized keyboard laid out in the conventional typewriter way, the full travel, light pressure keys give a positive reliable action. The Atom is ready to use with any colour or monochrome TV, or with a simple modification can be used with a video monitor. Colour output is built-in for use with a monitor; the PAL encoder is required for use with colour tv. The mininum Atom has an initial 2K of RAM and 8K of ROM which can be increased to 12K of RAM and 12K of ROM. BASIC and ASSEMBLER (machine code), graphics and sound output, and direct cassette and TV interfaces are standard features. 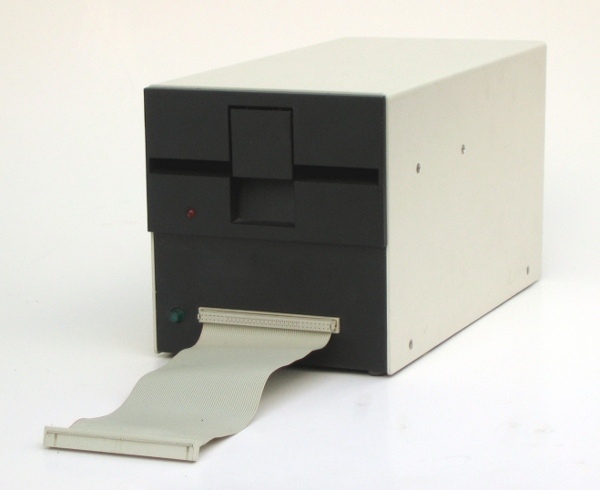 The printer interface output requires the addition on board of a i/o chip 6522 and a 74LS244 buffer. The new disk pack made by Acorn for use with the Atom offers amazing value for money. If put together from the parts at Acorn standard prices, it will cost well over £400. However, for £299 this unit cases complete with single sided single density disk drive, disk controller, disk operating system, power supply for itself and to drive the Atom that it is plugged into, 64-way cable to connect to the Atom and full documentation. The capacity of the drive is up to 92 KBytes, arranged in up to 31 files. Loading or saving a 4K program takes less than 1 second. The PAL encoder is a small board designed to fit inside the Atom to give it the facility to generate a colour signal suitable for feeding directly into an ordinary colour television, to give a full colour display. Even as this catalogue was being compiled, more news came in about hardware and software extensions to the Atom. LISP and BBC-type BASIC are now ready and deliveries will start soon. Pascal, although announced earlier, has been deferred, and will not be available for some time. Control Universal are manufacturing a 17K bytes DRAM card, which fills in the awkward gap in the memory map from 3C00 to 3FFF, and provides user RAM from 4000 to 7FFF, a continuous text space of 22527 bytes. Acornsoft have added another games pack, no 11, with "Missile Base", "Snooker" and "Dominoes". This new card is manufactured by Control Universal and offers a solution to the problem of addin memory to the Atom without leaving a gap. The 17K memory consists of 1K of static RAM from hex 3C00 to 3FFF and 16K of dynamic RAM from 4000 to 7FFF. This then provides continuous text space from hex 2800 to 7FFF (22527 bytes). Power requirements are low - can be expected to be within 300 mA. The recommended method of connection to the Atom bus is to fill the inner of the two bus connectors with vertical pins, and use a 64-way ribbon cable from those pins to the ATOMPLUS. (Both these items are on page 13.1). The ATOMPLUS is then bolted to the floor of the Atom case where it fits without interference with the Atom PCB. ATOMPLUS is completely compatible with all CUBE and Acorn rack mounting systems, and can be used to provide 16K RAM memory from hex 4000 to hex 7FFF. With the availability of the memory extensions for the Atom, it becomes interesting to enlarge the size of the change buffer. This has the advantage of allowing longer text entries without interruption, and much more convenient text manipulations, as blocks of 2048 characters can be handled, compared with 448 characters in the standard version. Disk files are then stored as starting from hex 3000, and become compatible with the the screen EDIT software offered for systems 3, 4, and 10. Note that some text processor commands differ between wordpack and Screen EDIT, and must be amended when changing systems. 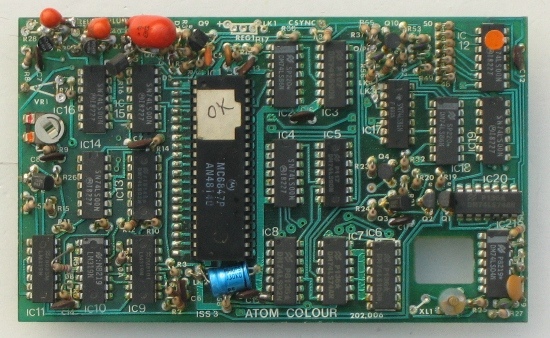 Available now, a 20K BBC ROM conversion module which can be added inside an Atom. It will support the full set of BBC-type BASIC commands. The BASIC syntax is identical so all programs that don't rely on the BBC hardware can be run on the Atom without any modification. The module is fitted in parallel with Atom BASIC and may be selected by a switch or from the keyboard if certain modifications are made. It consists of 16K BASIC ROM, a 4K operating system ROM and an additional 2K RAM that can be used by the Atom as well. A comprehensive BBC-type BASIC manual is supplied with every set giving full operating and fitting instructions. 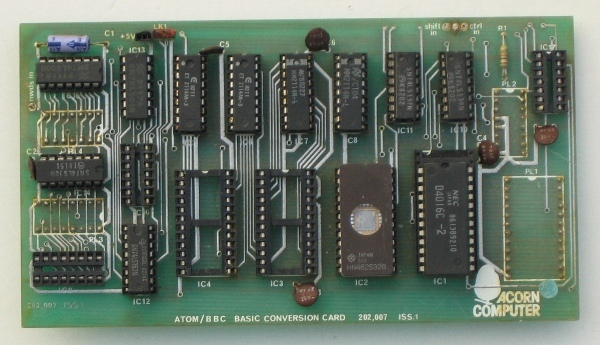 The BBC-type BASIC conversion board uses the same 16K BASIC ROM as used in the BBC Microcomputer. The board includes a 4K MOS ROM to provide the correct machine environment on the Atom. The board also includes logic to alter the memory map so that RAM is available from 0000 upwards, and so that the 16K BASIC ROM can reside at 8000 to C000. The BBC-BASIC TIME function is implemented by means of interrupts, generated by the Atom's 6522 timer (which must therefore be fitted). The BBC-type BASIC board is simply fitted by removing four integrated circuits from the Atom and inserting these in sockets on the BBC-type BASIC board. The board is then plugged into the empty sockets on the Atom. The board can either be wired permanently in BBC-type BASIC mode, or, with the addition of two wires to the Atom keyboard, you can select between Atom or BBC-type BASIC by pressing CTRL-BREAK or SHIFT-BREAK respectively.